Mario Draghi promptly shot down that idea. But according to a provocative paper released by none other than Pimco’s strategist Harley Bassman, Yves Mersch’s inadvertent peek into what central bankers are thinking, may have been on to something. He is of course, referring to FDR’s 1933 Executive Order 6102, which made it illegal for a citizen to own gold bullion or coins. 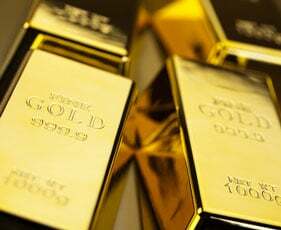 Americans promptly sold their gold to the government at the official price of $20.67, with the resulting hoard of gold was then placed in Fort Knox. The Gold Reserve Act of 1934 raised the official price of gold to $35.00, a near 70% increase. It also resulted in an implicit devaluation of the US dollar. As Bassman points out, over the three years from January 1934 to December 1936, GDP increased by 48%, the Dow Jones stock index rose by nearly 80%, and most salient to our topic, inflation averaged a positive 2% annually, despite a national unemployment rate hovering around 18%. In short, a brief economic nirvana which was unleashed by the devaluation of the dollarconfiscation of gold. In fact, we have frequently hinted in the past that another Executive Order 6102 is inevitable for precisely these reasons. However this is the first time when we see a “respected economist” openly recommend this idea as a matter of monetary policy. A massive Fed gold purchase program would differ from past efforts at monetary expansion. Via QE, the transmission mechanism was wholly contained within the financial system; fiat currency was used to buy fiat assets which then settled on bank balance sheets. Since QE is arcane to most people outside of Wall Street, and NIRP seems just bizarre to most non-academics, these policies have had little impact on inflationary expectations. Global consumers are more familiar with gold than the banking system, thus this avenue of monetary expansion might finally lift the anchor on inflationary expectations and their associated spending habits. The USD may initially weaken versus fiat currencies, but other central banks could soon buy gold as well, similar to the paths of QE and NIRP. The impactful twist of a gold purchase program is that it increases the price of a widely recognized “store of value,” a view little diminished despite the fact the U.S. relinquished the gold standard in 1971. This is a vivid contrast to the relatively invisible inflation of financial assets with its perverse side effect of widening the income gap. Admittedly, this suggestion is almost too outrageous to post under the PIMCO logo, but NIRP surely would have elicited a similar reaction a decade ago. But upon reflection, it could be an elegant solution since it flips the boxes on a foreign currency “prisoner’s dilemma” (more on this below). Most critically, a massive gold purchase has the potential to significantly boost inflationary expectations, both domestic and foreign. Many people will rightfully dismiss the gold idea as absurd, as just another fanciful strategy to print money; why not just buy oil, houses or some other hard asset? In fact, why fool around with gold; why not just execute helicopter money as originally advertised? I would answer the former by noting that only gold qualifies as money; and as for the latter, fiscal compromise on that order seems like a daydream in Washington today – don’t expect a helicopter liftoff anytime soon. Let’s be honest; most people thought NIRP was just as nonsensical a few years ago, yet it has now been implemented by six central banks with little evidence it is effective. And while a gold purchase program should qualify as a fairy tale, what is unique here is that it actually occurred with a confirmed positive effect on the U.S. economy. We agree, if for no other reason than everything central banks have done and tried in history has been a disastrous mistake, leading to either huge asset bubbles or massive busts, which in turn have needed even more spectacular bubbles to be reflated and so on. As such, the one thing that central banks should do is that which they are “genetically” against – purchasing the one asset class which is their inherent nemesis, the one Ben Bernanke said had value only because of “tradition”: Gold. Of course, all of the above assumes Americans would be willing to sell their gold to the Fed at any prices, but as Bassman finally lays it out, it is worth finding out. Janet, are you listening? Though it seems incredibly farfetched, a massive Fed gold purchase program could echo a Depression-era effort that effectively boosted the U.S. economy. As our title alludes, I am about to spin a monetary policy fairy tale, a fantasy that could certainly never occur … except for the small detail that it’s happened before. The notion was simple: Increase monetary velocity via financial repression to create inflation, depreciate nominal debt and deleverage both the public and private economies of the U.S. The toolkit of financial repression would include, but not be limited to, near-zero overnight interbank borrowing rates, massive asset purchase programs (also known as quantitative easing or QE), term surface restructuring (known as Operation Twist) and good old-fashioned jawboning, in this case taking the form of distant forward guidance. Notwithstanding various political exhortations, there can be little doubt the Fed’s aggressive monetary policies after the collapse of Lehman Brothers were quite effective in cushioning the macro economy from the financial turmoil. Would the economy have cured itself without the Fed? We can’t prove a negative, but up until China allowed the devaluation of the yuan last August and Japan implemented negative interest rates in January, the Fed’s “Plan A” was working reasonably well. But we do not operate in a vacuum, and various monetary machinations from the eurozone, Japan and China are now working in concert to export deflation to the U.S. This is quite worrisome as it may well hinder the U.S. economy from reaching the Fed’s target inflation level (2%) and escape-velocity economic growth. Thus did Fed Chair Janet Yellen, in her most recent visit to Congress, tentatively start to explore a “Plan B” (which looks like Plan A on steroids) that includes, if only in theory, the barest remote possibility of a negative interest rate policy (NIRP). There are a host of reasons PIMCO believes NIRP would be not only ineffective, but also possibly harmful to the U.S. economy, and these have been detailed by CIOs Scott Mather and Mihir Worah. But this does raise the question as to whether the Fed has indeed reached the bottom of its toolkit. Many things are possible, at least in theory, including the famous helicopter drop. Another option is to resurrect a plan that was actually implemented (with great success) 83 years ago. From shortly after the October 1929 stock market crash to just before Franklin Delano Roosevelt became president in 1933, U.S. gross domestic product (GDP) declined by nearly 43%; during a similar timeframe, consumer prices declined by nearly 24%. Employing what can only be described as force majeure politics, in April 1933 the U.S. government issued Executive Order 6102, which made it illegal for a citizen to own gold bullion or coins. Lest they risk a five-year vacation in prison, citizens sold their gold to the government at the official price of $20.67. This hoard of gold was then placed in a specially built storage facility – Fort Knox. The Gold Reserve Act of 1934 raised the official price of gold to $35.00, a near 70% increase; positive results were almost immediate. Over the three years from January 1934 to December 1936, GDP increased by 48%, the Dow Jones stock index rose by nearly 80%, and most salient to our topic, inflation averaged a positive 2% annually, despite a national unemployment rate hovering around 18%. So in the context of today’s paralyzed political-fiscal landscape and a hyperventilated election process, how silly is it to suggest the Fed emulate a past success by making a public offer to purchase a significantly large quantity of gold bullion at a substantially greater price than today’s free-market level, perhaps $5,000 an ounce? It would be operationally simple as holders could transact directly at regional Federal offices or via authorized precious metal assayers. While never an officially stated policy, there has been a slow-moving, low-intensity currency war taking place over the past decade. The U.S. was the first mover, implementing QE in 2009, which had the effect of depreciating the trade-weighted U.S. dollar (USD) by 16%. Japan was next, implementing “Abenomics” in 2012; this helped depreciate the yen (JPY) versus the USD by over 30% in eight months. Europe went last when Mario Draghi followed through on “whatever it takes” in 2014; the euro devalued versus the USD from peak to trough by 24%. China had pegged the yuan to the USD to help maintain a stable trading environment, however, the increasing value of their currency against their other trading partners was hindering growth, and thus the motivation for a slight realignment last August. The problem the world’s major economies now face is that any attempt to depreciate their currencies to improve the terms of trade must effectively come out of the pockets of their partners; this creates a classic prisoner’s dilemma. Thus the interesting twist of a Fed gold purchase program. Warren Buffett famously railed against the shiny yellow metal in 2012 when he noted all the gold in the world could be swapped for the totality of U.S. cropland and seven ExxonMobils with $1 trillion left over for “walking-around money.” His point was that these assets can generate significant returns while owning gold produces no discernable cash flow. It is liquid – this means people will readily accept it in exchange. By this definition, gold is certainly a form of money, and to Mr. Buffett’s point, one also earns no cash flow on paper dollars, euros, yen or yuan. In coda I would respond to the argument that a central bank cannot willfully create inflation – I disagree; it just depends upon how hard one tries. There are plenty of examples ranging from Weimar Germany to Zimbabwe where central banks have unleashed uncontrolled hyperinflations. The more interesting question is not whether the Fed can create a 15% to 20% price spiral, but rather can they implement policies that will result in a somewhat gentle and controlled 2% to 3% inflation rate that will slowly deleverage the U.S. debt load while simultaneously increasing middle class nominal wages. So when the next seat for a Fed governor becomes available, I would nominate Rumpelstiltskin … just a thought.